Every time you figure out where all the buttons are on Facebook, they move them! Several people have switched to the new timeline and are having a hard time finding the “protect your page” link to authenticate their page. If you do NOT see the “protect your page” option in that dropdown, then your page is either already authenticated, or you don’t have the option to authenticate it. You can try adding a map to your page (under location settings), to make it a “place,”which sometimes will make the “protect your page” option appear. I keep looking for other methods; if I find any, I will definitely post here! Hey Emily! It’s helpful to note that you have to be using your page as you, not as your organization, when you go to this gear box. 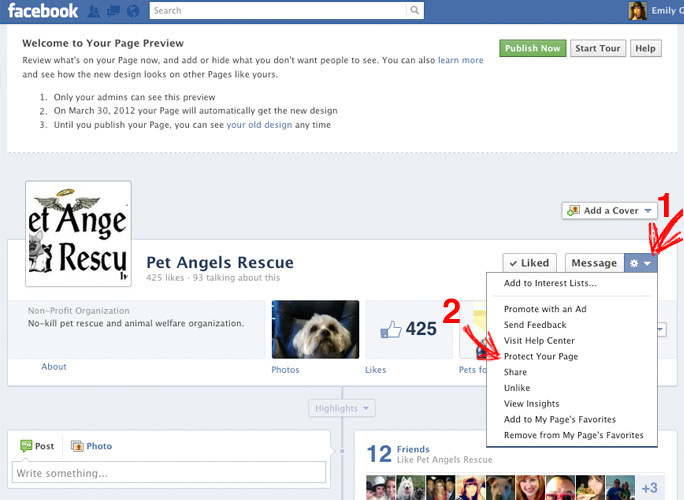 If you are using FB as page, the “Protect Your Page” doesnt show up, but it does if you are on your own profile and you then go to your organization’s page through the search function. Thanks again! Jen, that’s a great pointer! Thanks! I need to authenticate my page(s) that I want to merge, so i’ve gotten here. I do not see the “protect your page” as described above. Also how can you not login as your orgainization? When I login, it takes me to my 6 pages I have. I want to merge two of them that have different names. When I try that with the merge page option 2, it tells me that “The Page that you wish to merge with the Pages below must be an authentic Page”. I need help! It sounds like the problem is that you don’t have a personal Facebook login, you only have a business one. So this is not really how Facebook wants you to do things, so unless you approach it differently, you won’t EVER have the merge option (or many other options). What you probably did is create a business-only account. This means you login and you go directly to your pages. Facebook doesn’t want it to happen this way, although they do allow it (you’re not breaking any rules!). What they want is for you, Jeff, to have a personal account, and then you create a page for your organization and you are an “admin” on that page. Then you can make other people (who have their own Facebook profiles) admins on the page too, if you wish. But they want people to have profiles, and those people administer pages. If you approach it like you are, then you don’t have many of the options that you do if you go the regular route, and one of those is being able to merge your pages. Regardless, though, it is going to be difficult for you to merge two pages that have different names. No matter what you do, Facebook is probably not going to allow that. I would suggest you try the steps outlined in this post about Authenticating your page–it may give you some tips you haven’t seen before. This may work for you. But I think you’re still going to have to create your own personal Facebook account, and become an admin on your page. You don’t have to USE that personal account (like if you just do not want to be on Facebook at all). You can just have it exist to administer your Facebook pages. Hi there, great tutorials on this site, really life-saving! So, if I’ve got it right, in order to merge two pages you’ve got to be the authenticated user of the keeper page, and in order to do so, you’ve got to have a Personal Account (in addition to your keeper Page), isn’t that so? Yes, Facebook does want you to have a personal account that is an admin on your pages. This is necessary if you want to merge two pages. It’s not so much that YOU must be an authenticated user, but the PAGE itself must be authentic. For example, I couldn’t set up a page for Coca Cola and authenticate that page, because I am not an official representative of Coca Cola. So you have to prove (authenticate) that you’re an official representative of your page. Good luck! Emily – the “Protect your Page’ option doesn’t populate when I click the setting options. Actually, much of the drop down is different. Any advice? I have a personal account that admin’s the page I’m trying to authenticate. Thanks in advance! Great information that you have here. The screen capture of the new timeline fan page relfects info from March. As Facebook likes to do, there does not seem to be a cog next to the Message button on my fan page now.